KITsubs: Let's Go Kamen Riders! Net Movies 5-8, Scripts, and NEWS. Let's Go Kamen Riders! Net Movies 5-8, Scripts, and NEWS. Say what you will about Heisei Riders, or characters like Ankh... I love him. 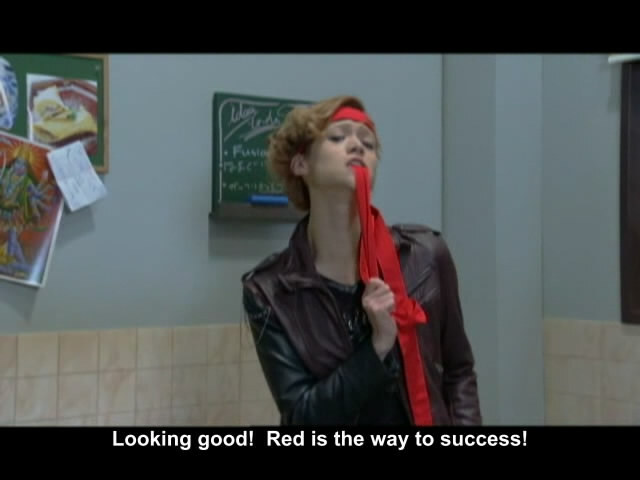 I think he's hilarious, and Net Movie 7 is full of Ankh shenanigans. Ryosuke Miura is at his best when he's hamming it up for these Net Movies. Now, for some crummy news. Veoh got a copyright complaint over Net Movie 8, so no streaming video in this update. However, they're up on KITsubs Veoh still (except for 8) so if you want to watch them streaming, you can. But none of that even matters if you're here for ddl links, which I have in abundance! And here's a zip with all 8 scripts. There's no raws available for these yet, but if you can rip FLV video then you can use these. BUT! You should download these, and hold on to them for the inevitable DVD release. Also, there's a bunch of extra stuff in the scripts. Alternate translates (See after the jump) and liner notes, and some stupid jokes. You can always open these up in AegisSub, or your subbing program of choice, and modify the translations to your liking. Read on for some rambling about the translation for Net Movies 7 and 8! Net Movie 7 has a tricky pun involving the Japanese word for chair (isu) and the Japanese word for Ice Cream (aisu). I did the best I could with it, but you can see it's very much transliterated. The script has an alternate translation (not active by default) with the LITERAL translation (Not funny. LESS funny is for you to judge.) Trust me when I say that Sjutton and me agonized over this one, but I trained under a waterfall in CORNINESS and I think I came out a better man. Episode 8 has a joke about two specific types of Japanese cards. Hanafuda, and Hyakunin Isshu. These aren't "Let's leave these Japanese because they sound cooler" words. They're names, like Haiku and Karaoke. Translating them seems inappropriate... but I did it anyway, because not a lot of people know what they are. BUT, I included an alternate sub track in the script that has the literal Japanese names. However, click those links if you want to understand the joke a little better. Thanks for watching, everyone! Hopefully we get a chance to do the rest of the Net Movies before the DVD is released later in the year.